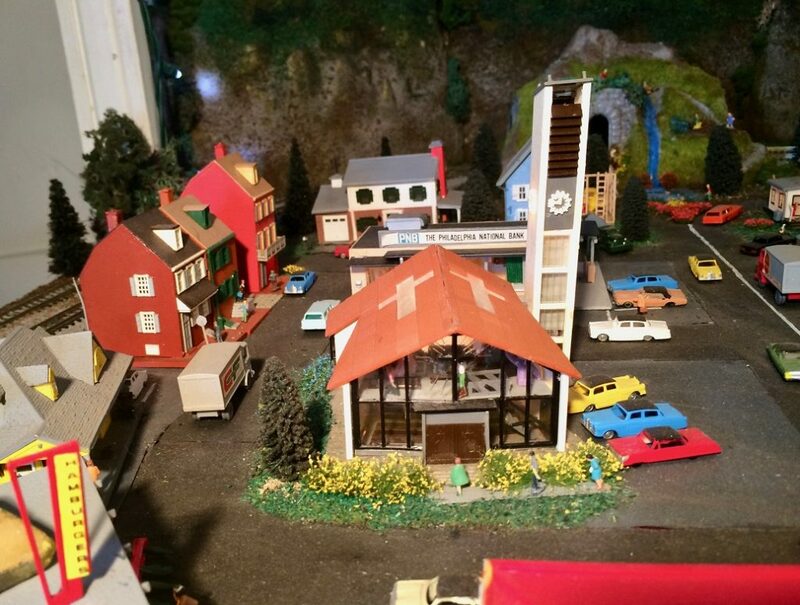 These photos represent the re-design of my HO scale model railroad layout from when I was a kid. In 2014, I decided to clean out my garage, get rid of a few things and paint. 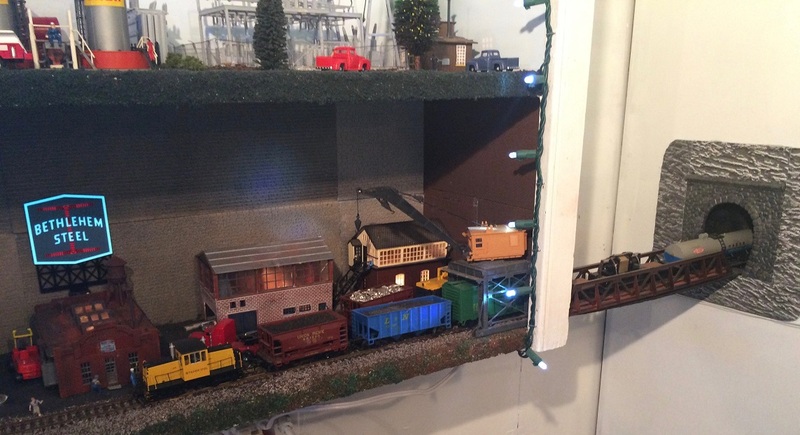 This created a space where I could take my time and slowly work on the layout, which was in storage for over 20 years. It was a labor of love as I re-started the hobby and realized that there had been a world of change since the 1980’s. 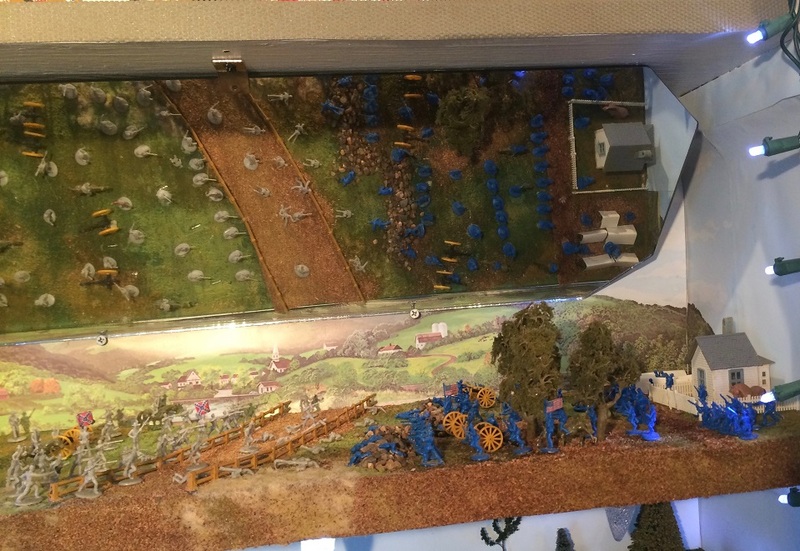 The pictures and video showcase the 4’x 8’ layout with the side mountain piece added to it. The mountain section was mostly white with a few spots of painted grass and stone original from the 1970‘s. I spent a long time working on it to make it look like a real mountain scene. As you can see from what it used to look like, it is a huge difference. There is so much I want to say, but, for this blog, I decided to just give you the overview of the main layout and mountain section and identify the shelf scenic designs. As you can see in the photos, this section features wall shelves that used to be part of garage storage. When the garage was revamped, I decided to make little dioramas on each shelf either of themes I liked or items that I knew would look nice. 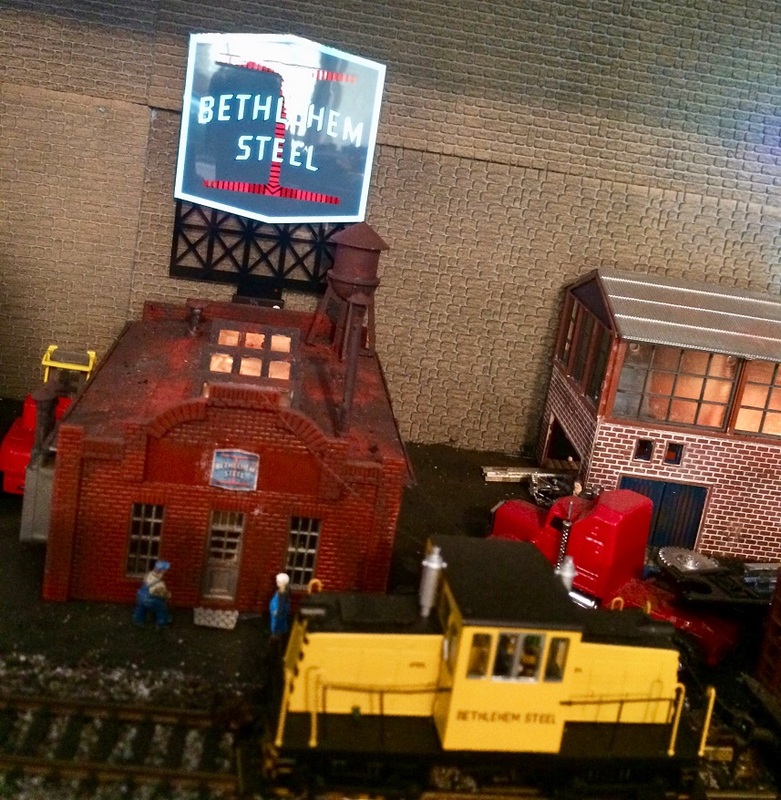 As you can see on the bottom level, I always liked the history and property of the old Bethlehem Steel. 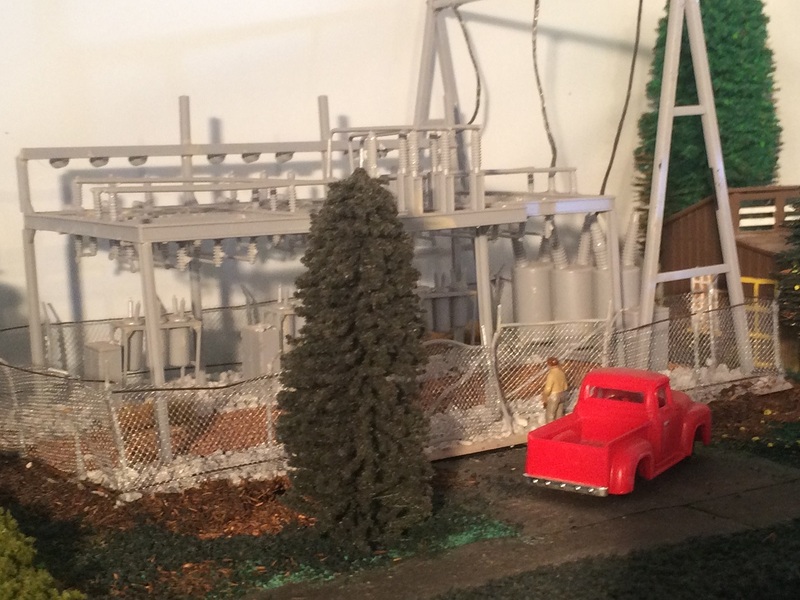 So, I chose to model that using buildings and scenery that I could weather and make it appear like it was part of the Steel plant. The coolest part of the whole shelf is the train coming out of the wall, into the shelf and right to the center. 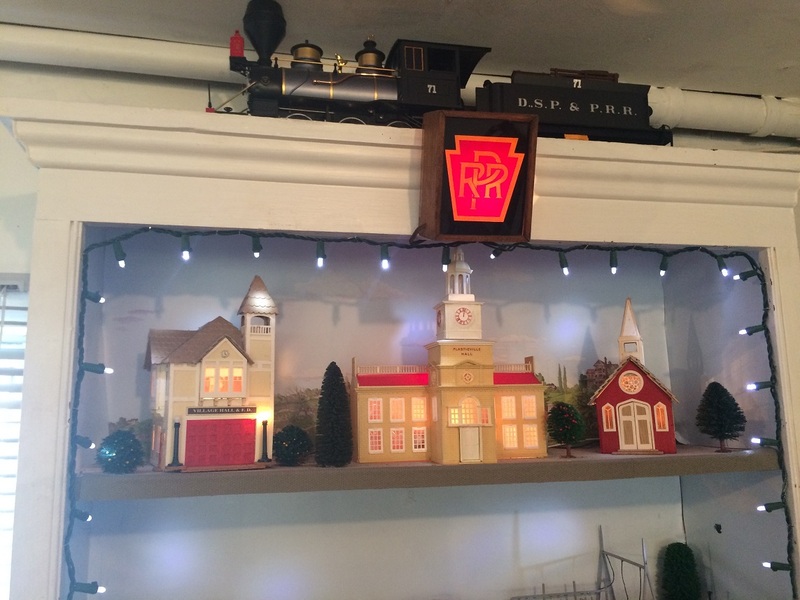 I wanted to have a train be a part of this and to just have it only be in the shelf just did not fit with my vision. So, with a few cuts and a bridge design, the effect is really cool and fitting of the mill. The two shelves above it are a bit simpler in their design. Due to site issues, I had to have larger buildings on the highest shelf with little detail or else you wouldn’t see it. So, I took a few larger scale structures and trees and created an old fashioned town square. The center shelf features a more utilitarian design with oil tanks and an electrical power station. The other shelf is quite personal and also features a ‘N’ scale layout on top of the filing cabinet. 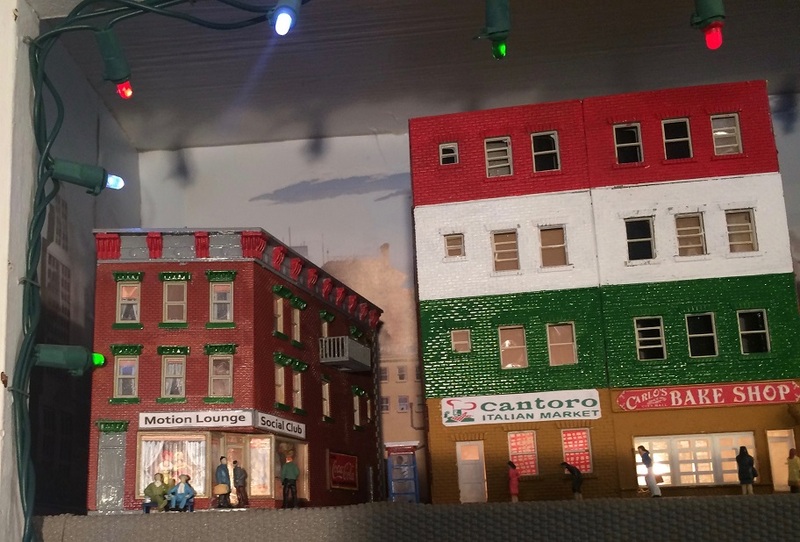 The top shelf represents my Italian heritage with a tribute to “Little Italy”. The one building is met with a little light humor as it is called the Motion Lounge Social Club. This was the actual mob hangout name in real life from the movie Donnie Brasco. 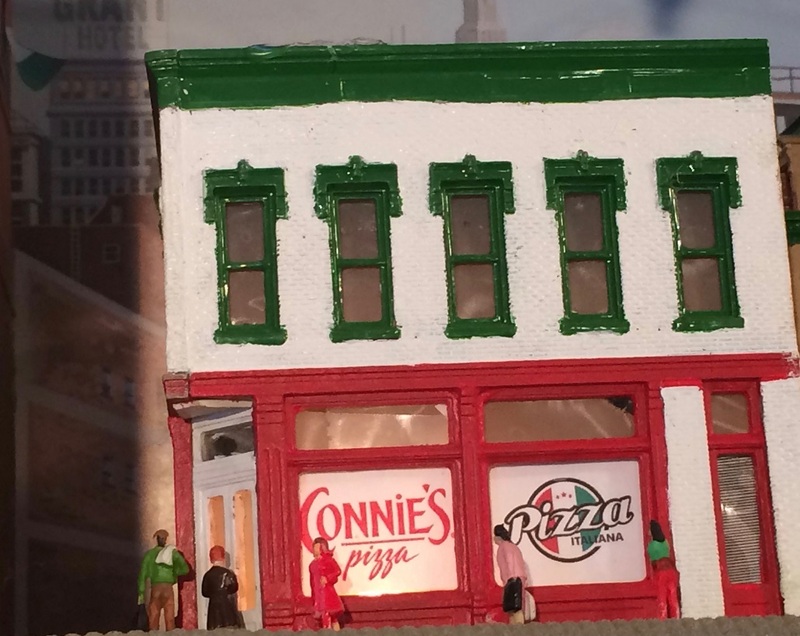 There is also a Carlo’s Bakery and a Connie’s Pizza named after my mom. I wanted to have a neighborhood feel and added the red, white, and green lighting for this shelf. This was fun to build and I think the background cityscape paper adds a nice dimension to it. The middle shelf represents my love of the Civil War and specifically, the Gettysburg Campaign. 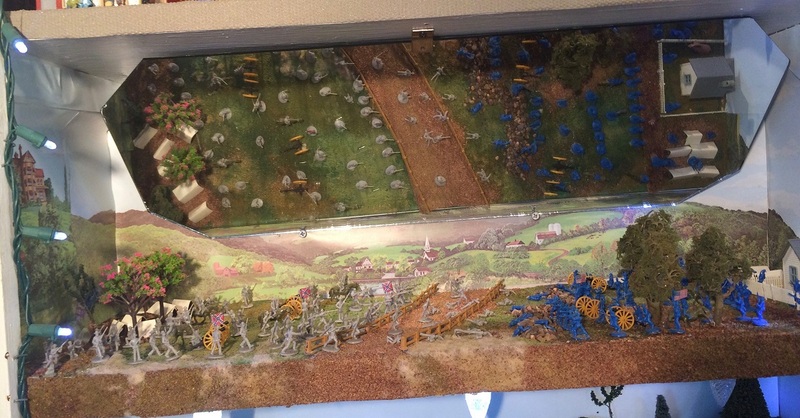 This models the final battle on July 3, 1861, Pickett’s Charge where he confederates suffered a tremendous defeat which forced them to retreat to the south. Since this design represented actual historical events, it had to be as realistic as possible. The problem with this shelf was since it features a lot of detail, especially with tiny soldiers, horses, and tents, I needed a way to bring the detail to those not over 6 feet tall. So, after a while of thinking about it, I found a mirror and was able to angle it so everything can be seen from below. I always liked the smaller ‘N’ scale. Since I had a few ‘N’ buildings and scenery on hand and the smaller area above the cabinet from which to model, it was a perfect fit. I am very proud of the back mountain scene. The 3 pieces are a combination of basic foam and pieces of an old bridge. I designed and glued it all to fit in this area and then worked on creating a real life mountain look with trees, grass, and stone. I am very proud the way this turned out. The town feel is relaxed and almost resembles the Delaware Water Gap area. 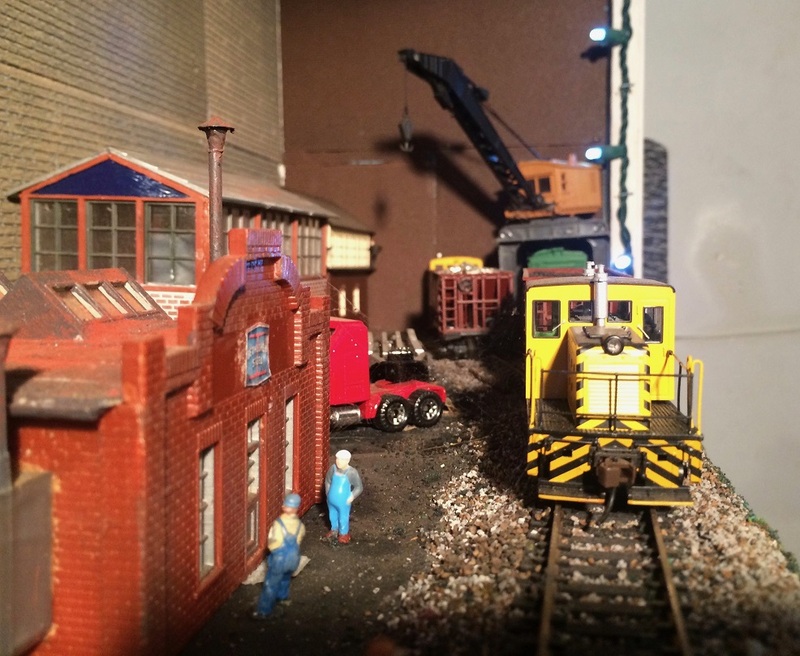 I never knew until 2014 just how much model railroading and the artistry that goes into every design was inside me. The chance to realize what I had for many years as a kid was too good to resist. When I was a kid, I always assisted my dad with the layout. I have enjoyed developing my technique and artistry with this hobby. 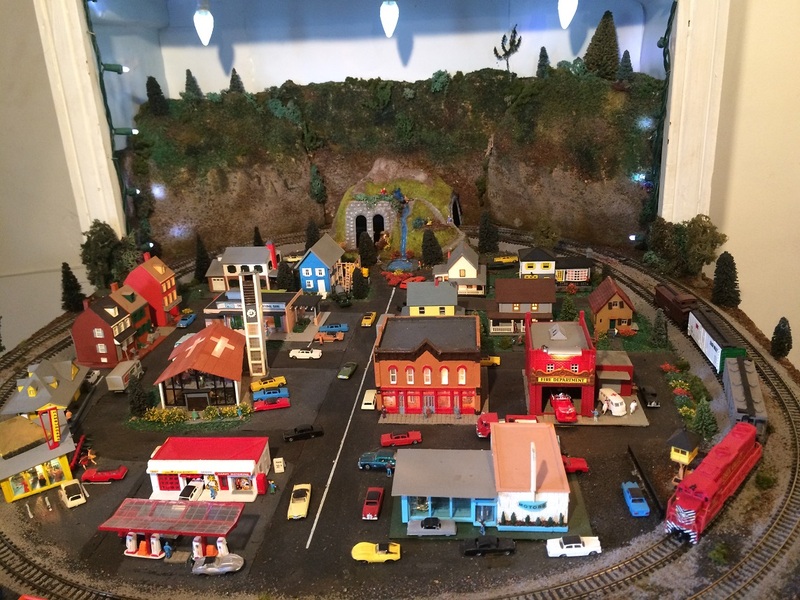 I hope to share this with others and hopefully someone will get the “bug” to enjoy a little model railroading.